What goes on in your brain and your body when you hear an action verb like slip, look, dig, run, or swim? 1. 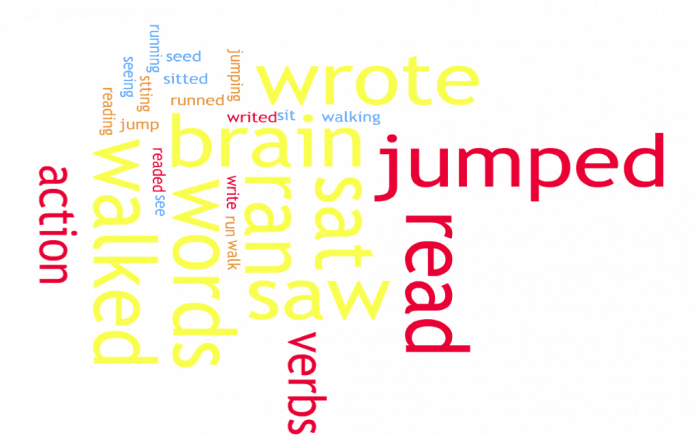 Action verbs like run, skip, and jump are formed like other words in the brain but damage to the brain can affect specific kinds of words depending on where the damage is. Recent research by D. Kemmerer indicates that the motor or movement aspect of verbs are represented in the precentral motor cortex, which is part of the higher brain at the top of the head. “Evidence is presented that the lexicon is part of a temporal-parietal [temporal cortex is on either side of the head around the ears] “declarative memory” system and that grammatical rules are processed by a frontamasal-ganglia [brain behind the forehead and nose area] “procedural” system. Patients produced past tenses of regular and novel verbs (looked and plagged), which require an ed-suffixation rule, and irregular verbs (dug), which are retrieved from memory. Word-finding difficulties in posterior aphasia [speech problems], and the general declarative memory impairment in Alzheimer’s disease, led to more errors with irregular than regular and novel verbs. Grammatical difficulties in anterior aphasia [speech problems], and the general impairment of procedures in Parkinson’s disease, led to the opposite pattern. In contrast to the Parkinson’s patients, who showed suppressed motor activity [difficulty walking and moving] and rule use, Huntington’s disease patients showed excess motor activity and rule use, underscoring a role for the basal ganglia in grammatical processing. (Journal of Cognitive Neuroscience, 1997). Health care professionals can use this information and in listening to their patients can gather clues as to what part of the brain is affected but how can regular people, healthy and those with brain issues use this information? Research from visualization and meditation indicates that by consciously focusing on using regular and irregular action verbs there can be some recovery or improvement in brain function. If someone you love has Alzheimer’s disease or Parkinson’s or some other memory or brain disorder, tell them stories with interesting verbs. Ask them to tell you a story, which can be true or fictional but should include actions. You might think that the irregular verbs would be more difficult and so compromised when there is a condition affecting the brain but that is not the case. A child who is learning language for the first time often makes mistakes with irregular verbs, once they have learned the rule for past tense. A child will often say, I runed, instead of I ran but as they grow and their brain develops they learn or memorize the irregular verbs and rarely will an adult say I runed unless they are joking around. This is true even of people with a brain disorder. 4. In an earlier study M. Walenski noted, that the reverse is true in brain conditions like Alzheimer’s disease. He used real and made up words as well as English and Italian words to test his patients. “Studies of English have shown that temporal-lobe patients, including those with Alzheimer’s disease, are spared at processing real and novel regular inflected forms (e.g., walk / walked; blick / blicked), but impaired at real and novel irregular forms (e.g., dig /dug; spling /splang). Here we extend the investigation cross-linguistically to the more complex system of Italian verbal morphology, allowing us to probe the generality of the previous findings in English, as well as to test different explanatory accounts of inflectional morphology. Contrary to the pattern observed in English, the errors made by the patients on irregulars did not reveal a predominance of regularization errors (e.g., dig / digged). The findings thus partly replicate prior findings from English, but also reveal new patterns from a language with a more complex morphological system that includes verb classes (which are not possible to test in English).” (Neuropsychologia, 2009). 5. The brains of people who are deaf and know sign language respond differently to signals that symbolize action verbs. K. Emmorey noted the difference between deaf signers and hearing non-signer when they watched a video of someone pantomiming or acting out an action and someone using sign language to communicate an action. “Deaf signers have extensive experience using their hands to communicate. Using fMRI, we examined the neural systems engaged during the perception of manual communication in 14 deaf signers and 14 hearing non-signers. Participants passively viewed blocked video clips of pantomimes (e.g., peeling an imaginary banana) and action verbs in American Sign Language (ASL) that were rated as meaningless by non-signers (e.g., TO-DANCE). Deaf signers exhibited functional connectivity with the right hemisphere that was not observed for the hearing group for the fusiform gyrus seed voxel. We suggest that life-long experience with manual communication, and/or auditory deprivation, may alter regional connectivity and brain activation when viewing pantomimes.” (Neuroimage, 2010). Quick! What is the past tense of run, show, dig, look, swim, and taste?